I promise that this blog won’t mention Dragon Age at all. But it does have some Alan Wake spoiler-type topics, so reader beware. 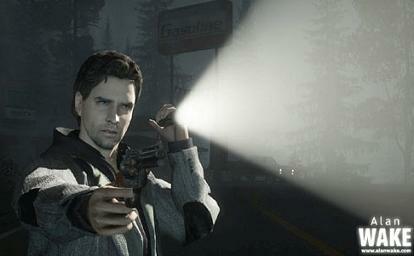 I started playing Alan Wake on Tuesday and it is chock full of creepy shadows and sharp axes. And trees…SO MANY LEAFY TREES. Although I fell victim to all of the anticipatory hype in the past couple of years, I actually didn’t do much research on the game itself. I knew it would be in the horror genre and use a flashlight as a weapon…but that’s about it. I had no idea it played out like a television show, with each episode ending with a title page and starting with a recap (Previously, on Alan Wake…). Overall, I was DELIGHTED to start playing and get caught up in all of the mystery and mayhem running amok in Bright Falls. Alan Wake is a writer whose books line the shelves alongside King and Koontz. He and his wife, Alice, have decided to go on vacation because AW is tired of writing books and has started hating his lack of privacy to an unhealthy degree (growls at fans). Alan has nightmares, Alice goes missing, and reality takes its own vacation. Is he living in the nightmare? Will he ever wake up? Or is all of this real? After Episode One it becomes clear that AW is acting out the narrative of an unwritten novel-by Alan Wake. How is all of this possible? I have no idea, I am only through Episode Two…but I have every intention of solving this mystery. 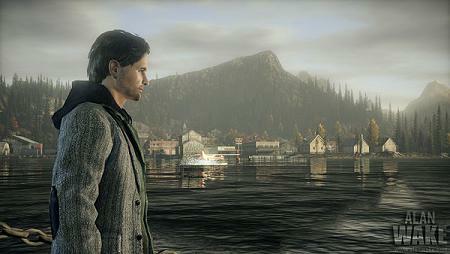 Alan Wake is one of the better developed games I’ve played in awhile. The world is fairly repetitive, but I have spent most of my time so far wandering through a National Forest (SO MANY LEAFY TREES) where the enemies are all axe-wielding lumberjack spooks. Each setting has its own fantastic details, though, and the televisions are my favorite. All of the televisions I have encountered are interactive. Some of them show a vision of AW pacing in front of a writing desk, fretting and pulling at his hair, muttering about the plot of an assumed work in progress. But is this AW in the real world, stressing over his writing or is it AW in the nightmare, imagining things? Other televisions display a show called Night Springs, which is very obviously a Twilight Zone rip-off, telling the story of a man who is attempting to prove some sort of metaphysical theories on mind over matter. The show seems completely separate from the overall game objective so far, but who knows? Maybe it will come into play later. Bright Falls is beautiful and guarded by a sinister murder of crows. Even the sub-characters seem fully fleshed out with individual personalities and styles. I can’t wait explore it further. The weapon system is a flashlight in your left hand and a firearm in your right. The light blinds the shadow enemies and the firearm finishes them off. Remember how third person shooters without auto-aim are a weakness of mine? Sigh. It has some auto-aim tendencies, so I am going to push on through and hone a new skill. Alan Wake, so far, you are worth it.